Deep brain stimulation (DBS) is a surgery to implant a device that sends electrical signals to brain areas responsible for body movement. Electrodes are placed deep in the brain and are connected to a stimulator device. Similar to a heart pacemaker, a neurostimulator uses electric pulses to regulate brain activity. DBS can help reduce the symptoms of tremor, slowness, stiffness, and walking problems caused by Parkinson's disease, dystonia, or essential tremor. Successful DBS allows people to potentially reduce their medications and improve their quality of life. In deep brain stimulation, electrodes are placed in a specific area of the brain depending on the symptoms being treated. The electrodes are placed on both the left and right sides of the brain through small holes made at the top of the skull. The electrodes are connected by long wires that travel under the skin and down the neck to a battery-powered stimulator under the skin of the chest (Fig. 1). When turned on, the stimulator sends electrical pulses to block the faulty nerve signals causing tremors, rigidity, and other symptoms. Figure 1. Overview of a deep brain stimulator (DBS). Electrodes are placed deep within the brain through small holes in the skull. The electrodes are connected by an extension wire to a battery-powered stimulator placed under the skin of the chest. Because the left side of the brain controls the right side of the body and vice versa, DBS is commonly performed on both sides of the brain. Neurostimulator – a programmable battery-powered pacemaker device that creates electric pulses. It is placed under the skin of the chest below the collarbone or in the abdomen. Lead – a coated wire with a number of electrodes at the tip that deliver electric pulses to the brain tissue. It is placed inside the brain and connects to an extension wire through a small hole in the skull. 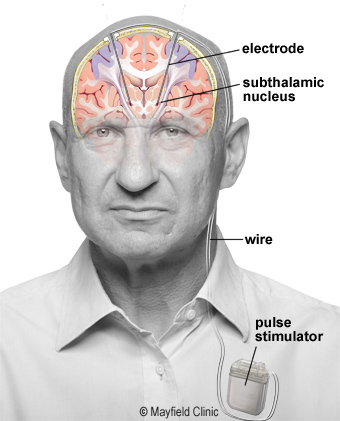 Extension – an insulated wire that connects the lead to the neurostimulator. It is placed under the skin and runs from the scalp, behind the ear, down the neck, and to the chest. The patient uses a handheld controller to turn the DBS system on and off. The doctor programs the stimulator settings with a wireless device. The stimulation settings can be adjusted as a patient's condition changes over time. Unlike other surgeries, such as pallidotomy or thalamotomy, DBS does not damage the brain tissue. Thus, if better treatments develop in the future, the DBS procedure can be reversed. DBS is very effective at reducing dyskinesias, the uncontrolled wiggling movements caused by high doses of levadopa medication. Typically, DBS will help make your symptoms less severe so that lower medication doses may be used. Figure 2. A cross section of the brain. Normal muscle tone, movement, timing, and coordination depend on complex electrical circuits or feedback loops in the brain. The basal ganglia are responsible for activating and inhibiting these feedback loops. In Parkinson’s, parts of the basal ganglia are either under- or over-stimulated. Normal movement is replaced by tremor, rigidity and stiffness. DBS of specific ganglia alters the abnormal electrical circuits and helps stabilize the feedback loops, thus reducing symptoms. Subthalamic nucleus (STN) – effective for tremor, slowness, rigidity, dystonia and dyskinesia. Most commonly used to treat Parkinson's disease. Thalamus (VIM) – effective for tremor. It is often used to treat essential tremor. Globus pallidus (GPi) – effective for tremor, slowness, rigidity, dystonia and dyskinesia. It is used to treat dystonia and Parkinson's disease. a movement disorder with worsening symptoms (tremor, stiffness) and your medications have begun to lose effectiveness. troubling "off" periods when your medication wears off before the next dose can be taken. troubling "on" periods when you develop medication-induced dyskinesias (excessive wiggling of the torso, head, and/or limbs). DBS may not be an option if you have severe untreated depression, advanced dementia, or if you have symptoms that are not typical for Parkinson's. Parkinson's disease: tremor, rigidity, and slowness of movement caused by the death of dopamine-producing nerve cells responsible for relaying messages that control body movement. Essential tremor: involuntary rhythmic tremors of the hands and arms, occurring both at rest and during purposeful movement. Also may affect the head in a "no-no" motion. Dystonia: involuntary movements and prolonged muscle contraction, resulting in twisting or writhing body motions, tremor, and abnormal posture. May involve the entire body, or only an isolated area. Spasms can often be suppressed by "sensory tricks," such as touching the face, eyebrows, or hands. A team of specialists including a neurologist, neuropsychologist, and neurosurgeon will evaluate your condition to determine if surgery is an option. Your thinking and memory, current medications, and general health will be evaluated. You will be videotaped performing a variety of movements (walking, finger tap, rising from a chair) while on and off medication. Your symptoms and abilities are measured using the Unified Parkinson Disease Rating Scale (UPDRS). After your evaluation and videotaping is complete, your case will be discussed at a conference with multiple physicians, nurses, and surgeons. The team discusses the best treatment plan for each patient. If the team agrees that you are a good candidate for DBS, you will be contacted to schedule an appointment with a neurosurgeon. DBS surgery is performed by a neurosurgeon who has specialized training in functional neurosurgery. The surgical team also includes a neurologist. Seek treatment at a medical center that offers a team approach and the full range of treatment options including medication, surgery, and rehabilitation (physical, exercise, voice, balance). The timing of when to consider DBS surgery is different for each patient. If you have severe motor disability despite optimal medications, then surgery should be considered. DBS should not be thought of as a last resort. As Parkinson's disease progresses, DBS is no longer an option if your symptoms don't respond to medication, or if you are severely disabled even in the best "on" state. And unlike other surgeries (pallidotomy, thalamotomy) that damage brain tissue, DBS is reversible and can be turned off or removed if necessary. You will typically undergo tests (e.g., blood test, electrocardiogram, chest X-ray) several days before surgery. An MRI scan of your brain will be performed. In the doctors office you will sign consent forms and complete paperwork to inform the surgeon about your medical history, including allergies, medicines, anesthesia reactions, and previous surgeries. Stop taking all non-steroidal anti-inflammatory medicines (Naprosyn, Advil, Motrin, Nuprin, Aleve, etc.) 1 week before surgery. Stop smoking, chewing tobacco, and drinking alcohol 1 week before and 2 weeks after surgery because these activities can cause bleeding problems. You may also need to have clearance from your primary care physician or cardiologist if you have a history of other medical or heart conditions. No food or drink, including your Parkinson's medication, is permitted after midnight the night before surgery. Try to get a good night's sleep. The DBS surgery involves multiple steps and lasts most of the day, during which you will be awake and off medication. Shower using antibacterial soap. Dress in freshly washed, loose-fitting clothing. Wear flat-heeled shoes with closed backs. If you have instructions to take regular medication the morning of surgery, do so with small sips of water. Remove make-up, hairpins, contacts, body piercings, nail polish, etc. Leave all valuables and jewelry at home (including wedding bands). Bring a list of medications (prescriptions, over-the-counter, and herbal supplements) with dosages and the times of day usually taken. Bring a list of allergies to medication or foods. Arrive at the hospital 2 hours before your scheduled surgery time to complete the necessary paperwork and pre-procedure work-ups. An anesthesiologist will talk with you and explain the effects of anesthesia and its risks. An intravenous (IV) line will be placed in your arm. For stage 1, implanting the electrodes in the brain, the entire process lasts 5 to 7 hours. The surgery generally lasts 3 to 4 hours. 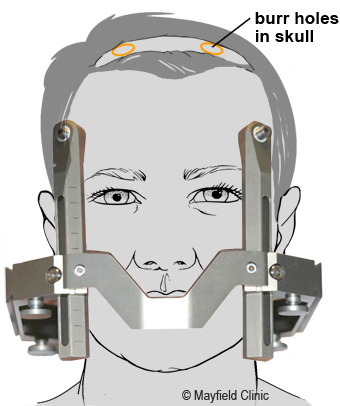 The procedure is performed stereotactically, which requires attaching a frame to your head. While you are seated, the frame is temporarily positioned on your head with Velcro straps. The four pin sites are injected with local anesthesia to minimize discomfort. You will feel some pressure as the pins are tightened (Fig. 3). Figure 3. 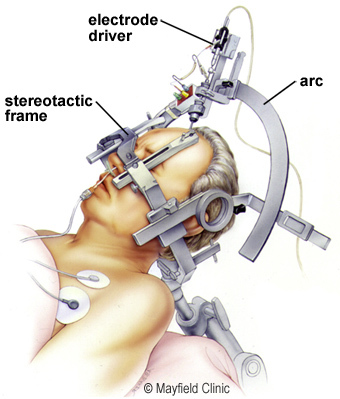 A stereotactic frame is attached to the patient’s head with four pins. An MRI scan is performed. A strip of hair is shaved and a skin incision is made across the top of the head. Two small burr holes (circles) are drilled in the skull to pass the electrode into the brain. You will then have an imaging scan, using either computerized tomography (CT) or magnetic resonance imaging (MRI). A box-shaped localizing device is placed over the top of the frame. Markers in the box show up on the scan and help pinpoint the exact three-dimensional coordinates of the target area within the brain. The surgeon uses the MRI / CT images and special computer software to plan the trajectory of the electrode. You will be taken to the operating room. You will lie on the table and the stereotactic head frame will be secured. This prevents any small movements of your head while inserting the electrodes. You will remain awake during surgery. Light sedation is given to make you more comfortable during the initial skin incision, but then stopped so that you can talk to the doctors and perform tasks. The hair is shaved about an inch wide along the incision line. A skin incision is made across the top of your head to expose the skull. Using a drill, two quarter-sized burr holes are made on the left and right sides of the skull (Fig 3). These holes allow the electrodes to be passed through the brain. Through the small hole, a recording electrode is inserted into the brain. Based on calculations from the MRI / CT scans and the planning computer, the electrode is inserted to a precise depth and angle inside the brain (Fig 4). The brain itself does not feel pain, so you should not feel any discomfort. Figure 4. An arc-shaped device is attached to the frame to plot the coordinates and drive the electrode to the exact location and depth in the brain. Accuracy of the electrode placement is confirmed by a number of tests. You may be asked to lift your arms or legs, or count numbers. The surgical team will also listen for the correct nerve cells. The recording electrode can hear the brain cells firing and display the waveforms on a computer. This is the most time-consuming part of the procedure. It must be repeated for both the left and right sides of the brain. Your patience and cooperation will help the surgical team do their job. The recording electrode detects the electrical waveforms of nerve cells. Once the exact nerve cells are located, the surgeon replaces the recording electrode with a permanent DBS electrode/lead (Fig. 5). Test stimulation is performed. You will be asked if you feel any of your symptoms lessen or completely go away. Figure 5. 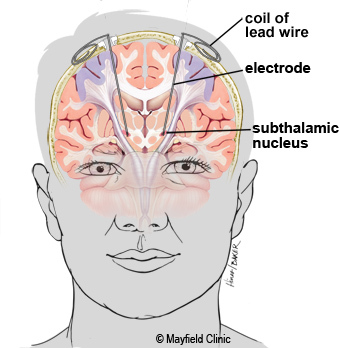 The electrode tip is placed precisely in the subthalamic nucleus (STN). A coil of lead wire is left under the skin for later attachment to the stimulator. When the team is satisfied with electrode placement, a plastic cap is placed over the burr hole to hold the lead in place. A coil of wire is left under the scalp for later attachment to the extension wire and the stimulator. The scalp incision is closed with sutures or staples and a bandage is applied. After surgery, you may take your regular dose of Parkinson's medication immediately. You are kept overnight for monitoring and observation. Most patients are discharged home the next day. During the recovery time after implanting the electrodes, you may feel better than normal. Brain swelling around the electrode tip causes a lesion effect that lasts a couple days to weeks. This temporary effect is a good predictor of your outcome once the stimulator is implanted and programmed. About a week later, you will return to the hospital for outpatient surgery to implant the stimulator in the chest/abdomen. This surgery is performed under general anesthesia and takes about an hour. Patients go home the same day. You will be taken to the OR and put to sleep with general anesthesia. A portion of the scalp incision is reopened to access the leads. A small incision is made near the collarbone and the neurostimulator is implanted under the skin. The lead is attached to an extension wire that is passed under the skin of the scalp, down the neck, to the stimulator/battery in the chest or abdomen. The device will be visible as a small bulge under the skin, but it is usually not seen under clothes. You should avoid arm movements over your shoulder and excessive stretching of your neck while the incisions heal. Pain at the incision sites can be managed with medication. About 10 days after surgery, you will be scheduled for an office visit. The stimulator will be programmed and your medication dosage will be adjusted. You may be asked to stop taking your medications for up to 12 hours before the programming session. This is done to increase the effectiveness of the programming in reducing your usual symptoms. It is important that you work with the neurologist and nurse to adjust your medications and refine the programming. You will return to the office every 3 weeks for programming. It typically takes 3 to 4 programming sessions to attain maximum symptom control while minimizing side effects. Most people don't feel the stimulation as it reduces their symptoms. However, some people may feel a brief tingling sensation when the stimulator is first turned on. It's important to remember that Parkinson's disease is progressive and symptoms get worse over time. You will return to the neurologist's office periodically to adjust the stimulation settings. No surgery is without risks. General complications of any surgery include bleeding, infection, blood clots, and reactions to anesthesia. Complications related to placement of the DBS lead include seizures, infection, and a 1% chance of bleeding in the brain. Reasons for which you might need additional surgery include breakage of the extension wire in the neck; parts may wear through the skin; and removal of the device due to infection or mechanical failure. Additionally, the battery will need to be replaced every 2 to 5 years. Some DBS systems have a rechargeable battery that may last up to 9 years. DBS may also cause worsening of some symptoms such as speech and balance impairments. In some patients with Parkinson's, DBS may cause or worsen depression. If you develop any side effects from a stimulation adjustment, you need to return to the office for further programming. Successful DBS is related to 1) appropriate patient selection, 2) appropriate selection of the brain area for stimulation, 3) precise positioning of the electrode during surgery, and 4) experienced programming and medication management. For Parkinson's disease, DBS of the subthalamic nucleus improves the symptoms of slowness, tremor, and rigidity in about 70% of patients . Most people are able to reduce their medications and lessen their side effects, including dyskinesias. It has also been shown to be superior in long term management of symptoms than medications . For essential tremor, DBS of the thalamus may significantly reduce hand tremor in 60 to 90% of patients and may improve head and voice tremor. DBS of the globus pallidus (GPi) is most useful in treatment of dyskinesias (involuntary wiggly movements), dystonias, as well as other tremors. For dystonia, DBS of the GPi may be the only effective treatment for debilitating symptoms. Though recent studies show little difference between GPi-DBS and STN-DBS. Patients report other benefits of DBS. For example, better sleep, more involvement in physical activity, and improved quality of life. Recent research in animals suggest that DBS may "protect" or slow the death of dopamine nerve cells . While the scientific data is inconclusive, observation of DBS patients show potential slowing of the disease relative to their pre-DBS condition. Once the DBS has been programmed, you are sent home with instructions for adjusting your own stimulation. The handheld controller allows you turn the stimulator on and off, select programs, and adjust the strength of the stimulation. Most patients keep their DBS system turned on 24 hours day and night. Some patients with essential tremor can use it during the day and turn off the system before bedtime. Your doctor may alter the settings on follow-up visits if necessary. If your DBS has a rechargeable battery, you will need to use a charging unit. On average charging time is 1 to 2 hours per week. You will have a choice of either a primary cell battery or a rechargeable unit and you should discuss this with you surgeon prior to surgery. Just like a cardiac pacemaker, other devices such as cellular phones, pagers, microwaves, security doors, and anti theft sensors will not affect your stimulator. Be sure to carry your Implanted Device Identification card when flying, since the device is detected at airport security gates. If you have any questions, please call Mayfield Brain & Spine at 800-325-7787.
basal ganglia: a mass of nerve cell bodies (gray matter) located deep within the white matter of the cerebrum. Has connections with areas that subconsciously control movement. bradykinesia: slowness of movement, impaired dexterity, decreased blinking, drooling, expressionless face. dopamine: a neurotransmitter that passes messages from neuron to neuron across a synapse. dyskinesia: abnormal involuntary movements that may be caused by either high or low levels of anti-parkinson medication in patients with PD. electrode: a conductor that carries electrical current. globus pallidus interna (GPi): nuclei in the brain that regulate muscle tone; part of the basal ganglia. neuron: basic unit of the nervous system, composed of a cell body, dendrites, and axon; also called a nerve cell. pallidotomy: a surgical procedure that destroys the nerve cells in the globus pallidus of the brain. Used to treat the symptoms of Parkinson's disease. stereotactic: a precise method for locating deep brain structures by the use of 3-dimensional coordinates. substantia nigra: an area of the brain where dopamine is produced. 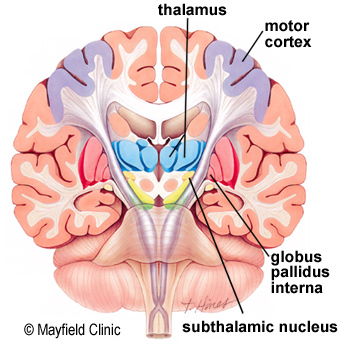 thalamus: a relay station for all sensory messages that enter the brain; part of the basal ganglia. thalamotomy: a surgical procedure that destroys the nerve cells in the thalamus of the brain. Used to treat the symptoms of tremor or pain. Mayfield Certified Health Info materials are written and developed by the Mayfield Clinic. We comply with the HONcode standard for trustworthy health information. This information is not intended to replace the medical advice of your health care provider. Mayfield Brain & Spine is a leader in the treatment of movement disorders, which include Parkinson's disease, essential tremor, and dystonia. In collaboration with premier hospitals in the Greater Cincinnati-Northern Kentucky region, we perform about 120 deep brain stimulation surgeries a year. With new capabilities at The Jewish Hospital – Mercy Health, we are able to perform deep brain stimulation (DBS) surgery for patients with Parkinson’s disease while they are asleep or awake. We encourage patients to seek treatment at a medical center that offers a team approach and the full range of treatment options, including medication, surgery, and rehabilitation. To make an appointment call 513-221-1100. Scott, who works as an architect, knew that Dr. Mandybur performed deep brain stimulation (DBS) surgery for people with Parkinson's and other movement disorders. "Would DBS surgery have potential benefits for me?" he asked. Click here for information about clinical trials conducted by our doctors at local Cincinnati hospitals or call 1-800-325-7787.